Yesterday I was hanging out at my mom's store and she introduced me to one of her customers. His name was Dan. Dan explained to me that he was once an atheist. He didn't and "couldn't" buy-in to what the church was teaching but eventually he came to Christ (I wish I would've asked him to tell me that story...). But even as a new Christian, he said, he couldn't swallow what he was being taught so he did some research of his own. Apparently, a great point of contention for Dan was the concept of Hell and eternal judgment. I'm sure that, like many of us, Dan noticed the inconsistencies in popular theology--how can we talk about an all-loving, all-forgiving, all-powerful God who, by the way, either sends people to an eternal torment with fire and pitchforks, and all that stuff? So rather than rejecting the whole thing, he read some books... a good model for learning and one I think we're losing in our society. He showed me some books and commentaries that he'd found from way back in church history, all dealing not only responsibly but biblically with the concept of eternal torment. Dan and I talked, probably for about an hour, about folks like C.S. Lewis, N.T. Wright and, not to mention, Rob Bell. Dan and I both expressed the fact that we don't want to wear the label of "universalism" but we we both wanted to leave room for hope. Indeed, there are so many different angles, so many different passages of scripture, so many different definitions to navigate... the conversation is much more complex than a simple "yes" or "no" to universalism (or Christocentric inclusivism, as I like to call it). After all, no matter what you think of an eternal or eschatological hell, you can't deny the hell that we create here and now. One of the most interesting things, indeed one of the most resonating things that Dan pointed out was this: people associate universalism with liberalism. But, in fact, historically there have been many universalists who could just as easily be referred to as conservatives. You don't have to be a Unitarian or a pluralist to believe that God can save everyone and everything. This resonates for me because it is in my most conservative, Trinitarian, and even Calvinist moments that I find myself closest to the concept of total and universal salvation. 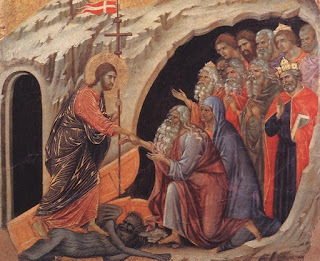 It is out of my belief that Christ was God that I find room to believe that if God can redeem the cross by dying on it, then God can certainly redeem hell (does not the apostles Creed itself say that Christ descended into hell?) Wherever God goes cannot be separated from God... so if Jesus is on the cross (and it doesn't get much more hellish than that) then God is there too. It is my conviction that the Bible is the authoritative Word of God that forces me to wrestle with verses like 2 Peter 3:9 and 1 Timothy 2:3-4. If I didn't believe that the Bible was authoritative then I might believe in a God who's a lot like me... quite vindictive and ready to watch his enemies burn. But the Bible shows us a God who's willing to die for God's enemies. The Bible's God is nothing like me. Indeed, I am also quite exclusive in this. No other God could save the world. No God but the one revealed in the Scriptures and in the life of Christ can save. Indeed, I am conservative enough to say that there is no other way to eternal life than through Christ and his sacrifice & resurrection. If I believed that there was another way, then I certainly wouldn't have to be a universalist. If God didn't have the market cornered on salvation, then God wouldn't have it cornered on judgment either. The most persuasive argument for universalism has to be Calvinism--is there a theological system that's much more conservative than that? Follow me through the TULIP. Total Depravity= We're all flawed. We're all on even ground. We're all totally depraved. No one can be less "total" in their "depravity" than another. So if God can save me, then God can save even the worst kind of person since, after all, they're no worse than me anyway. So my only hope for salvation is that there's also hope for them. So the question is, if we're all totally depraved on what basis does God save. If God's gonna save some, what's stopping God from saving them all... it's no harder to save one than another. This point leaves tons of room for universal salvation. Unconditional Election= In other words, we don't have any say in our own salvation. It has nothing to do with us but is completely dependent on who God is. Well, the God I read about died on a cross. The God I read about said that "God so loved the world..." The God I read about said "behold I am making all things new." So, at least from an eschatological perspective, if we've got nothing to do with our own salvation, then I am inclined to believe that God will choose to save the ones God loves. Is there anybody God doesn't love? If you can say "yes" to that question, then you're beyond conservative. You're ignoring your own Bible... "God is love." If God wants to save everyone, then God can since it has nothing to do with them anyway. They have no choice in the matter. Limited Atonement= This is the point that lets most Calvinists off the hook. Well, the atonement was limited to the elect only--for some but not all. But this point doesn't stop us, especially if we affirm the authority of scripture. If the first points are true then God's criteria for choosing "the elect" has nothing to do with them. So, like the "U" point, it comes back to who God is. If God's election is completely up to God, then what would stop God from electing everyone? On the basis of God's freedom and God's sovereignty, then, we cannot limit God so much as to say that God's election must be limited. So if God's atonement is limited to the elect, that's fine. But nobody can limit God enough to say that election is limited... that's not one of the points of Calvinism. So, once again, we've got room for hope--hope that all might be elect. Did not Christ die for all? Irresistible Grace= This just means that God's grace can't be denied. In other words God can give grace to whoever God wants, and God always gets God's way in this regard. So, again, it comes back around to God's sovereignty. Who can limit God enough to say that grace can't be given to all? And if grace is given to all, then nobody can resist it. If God wants everyone to be saved, eventually that's where things are going. Perseverance of the Saints= And this point simply means that if God chooses you, you can't be unchosen. You're in it til the end, like it or not (let's face it, you'll like it eventually... remember the "I" point?). I'm also still a conversionist (I beleive that people must make a decision to give their lives to Christ...even if it's a process in itself). Converting to Christ, offering you're life to Christ isn't just about going to heaven or avoiding hell when you die and it's not "liberal" to say that. Following Jesus and deciding to do so with your whole life is a spiritual necessity here and now. Indeed if you believe that history is headed toward total salvation then you might have better reason to give your life to Christ. Of course you won't be doing so because you'll go to hell if you don't, you'll give yourself to Christ because that's where history is going anyway. Following Jesus isn't about going somewhere else, it's about tuning your life into God's hope for the world. It's about being the change that God wants to see in the world. If you don't give you're life to Christ now, it's not a future hell you need to worry about, it's the one you're creating all around you when you live against the flow of God's vision for the world. Imagine the damage we do to our souls when we constantly point them and position them against what's natural for them. Remember, God will get what God wants. When I study scripture, I can't say that there's not tension in some passages, but I can't help but see a God who, if given freedom of choice, would save everything and everyone. The only way that hell can exist in this regard is if God doesn't always get God's way. Yes, I do have a problem with that statement on one level, but be honest, does God always get God's way here and now? What is sin if it's not something that's against what God wants? So, on another level, I lean toward universalism not because I take sin lightly but precisely because I take it very seriously. We ARE capable of living outside of God's will. But if God defeated sin on the cross, then God defeated everything that goes against God's will, which means that eventually, God's got to get God's way. It's called sovereignty. Hell, throughout scripture, is a product of sin. If sin is defeated, what does that say about hell? If, however, hell is God's creation, God's choice, and God sends people there, then what does that say about God? Well, the wrath of God in the Bible is never arbitrary. It is always about restoration. So, the freedom of God to save all is maintained on this side as well... God's wrath is a means to an end... which means that it's got to end. Restoration eventually wins out. So, you see, universalism can be a product of conservative theological reflection. You can still believe in the authority of the Bible, the sovereignty of God, the seriousness of sin, the exclusivity of Christ and his divinity, the need for conversion etc. Indeed, each of these cornerstones of conservativism can actually produce a universally eschatological soteriology. Perhaps this is why people like Dan and I don't fit in anywhere. The liberals think we're too conservative because we won't let go of the exclusivity of God's sovereignty in Jesus Christ and the conservatives think we're liberal because we think that there's at least room to hope that history is headed toward total salvation. I've been comparing Universalism and Calvinism in my head for the past two months! My roommate is in the Reformed tradition, and we've had some interesting conversations about this. Thanks for articulating it so well! Don't worry about being in the middle. Since I became a universalist, this old liberal has also become more evangelical and Bible-believing. For me,too, it was the loving God / never ending punishment contradiction which marred my faith and Christian confidence. But the Biblical basis of universalism is now so well established, it's really the most wonderful blessing of all. ps: everything you said was also a blessing -- Thank you ! !